At 21, Jayson Foley is an anomaly in the sheep-shearing industry – a rarity at work this week in a sun-lit barn north of Windsor, CO.
Weld County, Colorado, ranks first nationally for its number of sheep and lambs, but even here, Foley seldom, if ever, sees someone similar to his age along the wool-trimming circuit, he says. He and others in the local sheep industry estimate that many of the shearers he works with are in their 60s. But he's OK with that – more than happy to do a job few others are willing to, while using a skill that seemingly has endless opportunities down the road. The workload is heavy at times, but when Foley graduates from Colorado State University (CSU) in May with a degree in Animal Sciences, he'll have finished his college education debt-free, he says, thanks to the sheep-shearing dollars he's earned along the way. Foley's line of work has other perks. While he does about two-thirds of his shearing at feedyards in the Greeley area, Foley travels to New Zealand, England, Scotland and Wales during his summer breaks. Foley said he's actually had to turn down some offers in Finland, Norway and Italy. With different climates and larger sheep herds around the globe (New Zealand, for example, has 30 million sheep compared to the 5 million in the U.S.) shearers can find work year-round. "One guy I've worked with only took off three days in an entire year," Foley said. "And he only took those three days off because he was on a plane." 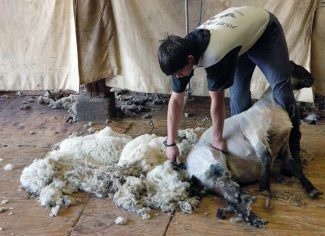 With skilled sheep shearers limited, Foley often gets more requests than he can tend to, he said, and he doesn't have to advertise. And because the number of sheep-shearers close to his age is even more meager, Foley believes he's well-positioned for the future. Foley and others in the local sheep industry – including Nels Nelson, who operates Cactus Hill Ranch near Windsor, CO, a feedyard with a capacity of about 150,000 head – can quickly tell you why shearers are few and far between. "It's just really hard work," said Nelson, noting that much of the wool from his operation goes to an auction facility in New Mexico. "It's about that simple." Sheep shearing for lamb producers often kicks into high gear prior to the lambing season, which is from March to May. But in feedyards, shearing can take place year-round, Foley said, which is why he stays so busy around Weld. In a typical day, Foley and his older co-workers shear between 175 and 200 sheep, sometimes more or less, trimming the wool off each animal in about two minutes. Ewes typically weight about 190-200 pounds. In feedyards, lambs are often fattened up to about 130-140 pounds, and they're heavier now, since the demand for mutton is low and sheep are staying in feedyards longer. Foley said some of the feedyard sheep he's shearing now are old enough to be in the 200-pound range, which doesn't make his workload any lighter. 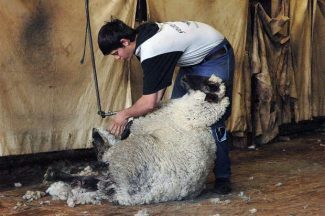 Foley said the animals don't often wrestle against him; the sheep he was shearing Monday morning docilely leaned against his legs as he trimmed their wool with motorized clippers, which cost about $2,000. Still, he explained, just maneuvering an average of about 185 sheep into position, at around 160 pounds each (which adds up to nearly 30,000 pounds of livestock per day) can take a toll on a body, especially since sheep-shearers are bending over all day while doing it. Only someone born into the business – or "doomed" into the business, as he described it, laughing – would likely enter the profession, he said. To say Foley was born into sheep shearing would be an understatement. His father, Dave, is a "legend" in the industry, as Nelson and other locals described him. Dave moved from his native New Zealand to Wyoming when he was 21, to put to use his sheep shearing in the U.S., where the skill is uncommon. After arriving, he met his wife, Janine, whose grandfather was a sheep herder who came to the U.S. from the Basque country of the Pyrenees Mountains along the France-Spain border. In addition to their family ranch near Kaycee, WY, Dave and Janine started Foley Shearing in 1989, and now operate crews that shear around 175,000 sheep each year in Wyoming, Colorado, other states and overseas. Jayson, who does most of his shearing work on his own, is hoping to take over the family business some day, noting that his parents have put it in good position for him. Dave's reputation in the industry has certainly helped with the growth of the family business, Jayson said. Dave has won numerous sheep-shearing contest, including the one at the National Western Stock Show in Denver. Jayson himself won the National Western's junior-division sheep-sheering competition a couple years ago – before the contest was ended due to complaints from animal rights activists, he said. That move didn't sit well with Jayson, nor do activists' ongoing concerns regarding sheep shearing. As he explained, the animals need their wool trimmed. Trimming ewes before lambing helps prevent infections when the lambs are born, and, in general, having mud and dirt collect in untrimmed wool can be breeding grounds for bacteria. Having less wool during warm months helps with the comfort of the animals, and even shearing them in winter months can help with their comfort, Foley added, because wet wool after rain and snow can make them colder than having no wool at all. Trimming wool to a certain length is also beneficial for the meat packers who process the animals. And as far as handling the sheep as he does his shearing: "I treat these animals better than I do people," he said with a smile, between rounds of shearing a couple 200-pounders. He wasn't even out of breath. Editor's note: Jayson is also a member of the CSU Livestock Judging Team that became the Reserve National Champion team at the National Collegiate Livestock Judging Contest in December – topped only by Oklahoma State Universtiy by just nine out of the 5,000 possible points.